In Mark's Jan 5th post, from The Bagman and Butler Chronicles. he talked about the seeming norm of only giving and receiving pleasant, encouraging comments in the blogosphere. He and others mentionned how they occasionally craved some constructive criticism or feedback. Others commented that they prefer things remain as they are, because they receive enough criticism in every day life. This discussion brought to mind the psychological model known as the 'johari window" also known as the "Feedback/Self-Disclosure Matrix". The concept is that we all have basically 4 quadrants of self at play all the time in every relationship and three of these quadrants change according to who we are relating with and how we are relating. There is much to learn from this model, but we'll stick to the basics here in applying it to our relating as bloggers. You may have noticed that those who keep much hidden, may not have as many followers as those who have revealed more about themselves, or brought more of them self out into the open on their blog. You may also have noticed that you have learned things about yourself through blogging that you might previously have been blind to. The crux of the johari window is about these fluctuating windows of our personality - about how to open them or close them and how to develop more meaningful and enduring relationships. There is no one way to be. Some of us desire more privacy and have every right to keep as much hidden as we choose. Others are naturally more open and less private. You may have encountered some blogs where more is revealed (brought into the open) than you ever wanted to know (TMI). This model of interpersonal relating was developed by Ingham and Luft. Interestingly, Luft and Ingham called their Johari Window model 'Johari' after combining their first names, Joe and Harry. In early publications the word actually appears as 'JoHari'. The Johari Window soon became a widely used model for understanding and training self-awareness, personal development, improving communications, interpersonal relationships, group dynamics, team development and inter-group relationships. The Johari Window model is also referred to as a 'disclosure/feedback model of self awareness' . . . The Johari Window actually represents information - feelings, experience, views, attitudes, skills, intentions, motivation, etc - within or about a person - in relation to their group, from four perspectives, which are described below. Since we are continually learning more about ourselves and revealing or hiding information about ourselves to others, these areas/quadrants are different in every relationship. For example, with one person, our hidden area may be very small - there is a lot known by both about you. With another person, with whom you are just getting acquainted, your hidden area may be very large as there is still much you have chosen not to disclose. No two people are the same, nor should we expect anyone else to match our degree of openness or self-awareness. 1. KNOWN BY SELF AND KNOWN BY OTHERS - what is known by the person about him/herself and is also known by others - open area, public self, open self, free area, free self, or 'the arena'. Our open area is different with every relationship, because we have revealed or disclosed different things to different people or groups. In blogging, the main interests and topics of your blog, are in the open area - known by you and known by your readers. 2. UNKNOWN BY SELF BUT KNOWN BY OTHERS - what is unknown by the person about him/herself but which others know - blind area, blind self, or 'blindspot'. This area, to which we ourselves are blind, (for example, I may be blind to the fact that I continually interrupt when others are talking) is opened by appropriate FEEDBACK. While it can sometimes be hard to receive feedback about how we relate or how we affect others, it is key to growth. We can develop only once we become aware of things we have been blind to about ourselves. We also need to learn how to appropriately give feedback to others so as to help the relationship, help them grow, and not wound them or the relationship. (The basic guideline for constructive feedback is to speak about the behaviour, not the person. For example: "When you interrupt me in mid-sentence, I feel pushed away and hurt, Bonnie." Avoid 'you statements' such as: "You are a self-centered b---- who never lets anyone else get a word in edgewise, Bonnie". The feedback statement model is "When you....(name behaviour)............I feel........(name your feeling).........". Put downs and name calling will only put up a fence between you.) In blogging, perhaps we could be blind to the fact that we always blog about the same thing, or that our blog has an angry tone. We all have blind spots and it helps not to be too defensive when they are pointed out to us with feedback. We can also ask for feedback, from someone we trust, about our blindspots. 3. KNOWN BY SELF BUT UNKNOWN BY OTHERS - what the person knows about him/herself that others do not know - hidden area, hidden self, avoided area, avoided self or 'facade'. Parts of this hidden area can be moved into the Open Area (quadrant 1) by appropriate SELF-DISCLOSURE. You do not, of course, have to or want to disclose all of the hidden parts of yourself, but if you want to connect, have relationships, deepen relationships you must reduce the size of your 'hidden quadrant' and bring more information into the open quadrant. This is done by sharing and disclosing information about yourself that the other person does not yet know. Self-disclosure is key to developing intimate (open) relationships. All bloggers are continually working out how much to post from the hidden area and bring into the open area of their blog. There is no right 'size' for this hidden area. You are in charge and there may be big areas of your life and experience that you will never bring into the open area of your blog. If you decide you want to deepen relationships here (as much as they can be in this medium) it will require some self-disclosure. Self-disclosure signals that we are moving a step closer. When you disclose, it often moves others to disclose as well. Disclosure should be appropriate - wanton divulgence can be off-putting in blogging as in any relationship. 4. UNKNOWN BY SELF AND UNKNOWN BY OTHERS - what is unknown by the person about him/herself and is also unknown by others - unknown area or unknown self. This is basically the area of the unconscious - unknown by you and unknown by others - and is best dealt with alone or in therapy, if at all. This does not factor into facilitating better interpersonal relating in this johari model. So in a desire to be self-disclosing and not simply share dry information I'd like to bring into the open area what I am aware of about my 'johari window' way of relating with my blog. When I created the blog, it was in conjunction with my Etsy site and intended, at that time, to be a vehicle to share my artwork and photography. I immediately saw that I could share some psychological concepts that I hoped might be helpful as well. It was a rather impersonal, professorial approach (I do have a masters degree in education) and an approach I still struggle with here. I soon discovered that the blog could serve as a vehicle for sharing my values, principles, learnings, etc. with my children and grandchildren - so a lot of my choices in posts are to share with my progeny what matters to me, in hopes that one day some small portion of it might prove useful for them. As I visited other blogs, I discovered other bloggers were revealing much more about their personal lives and daily experiences than I, and I knew that I had inadvertently trapped myself into keeping a lot hidden because without a lot of foresight, I had revealed my name in my Etsy shop and here on my blog. 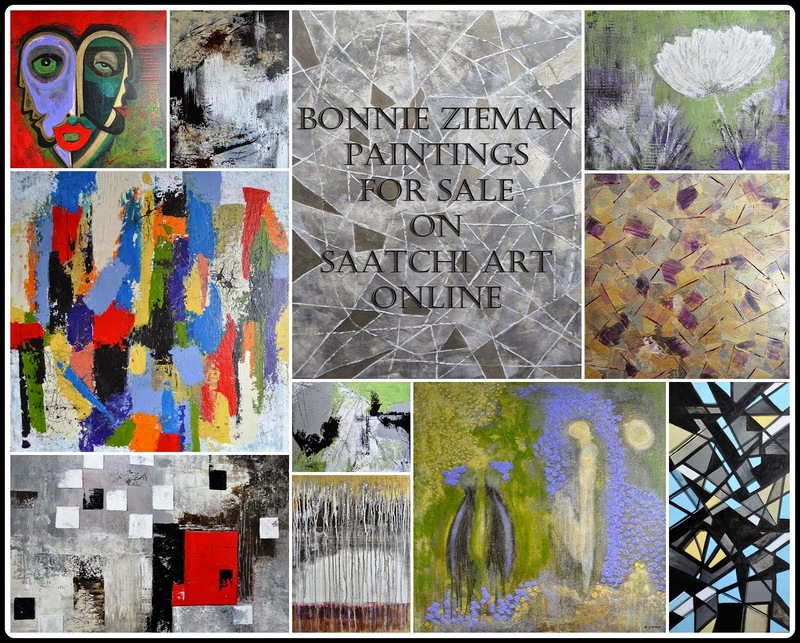 If I were to do it again, I would try to keep my identity private - although when selling artwork I'm not sure it is entirely possible. At the very least it would have taken a lot of thought and a lot of planning - which I did not do before creating the blog. Being open about my identity means my therapy clients can find the blog and read any personal revelations. Psychotherapists generally reveal little about themselves while working with their patients so as not to become a distraction and to provide a blank slate on which the client can project some of their issues. Then the work can proceed in the 'here and now' using this dynamic as grist for the therapy mill. Voila my struggle. I have the impulse to reveal more of myself, my missteps, my struggles, my life experiences - but at the same time feel I must be cautious and not reveal anything about myself that could upset or distract a client. So dear blogging friends, I keep more to myself (in my hidden quadrant) than I would prefer....but I do so consciously and for a reason. I also realize that this limits the amount of intimacy (mutual openness) that can result. I have received valuable feedback while blogging when I (twice) left comments that were probably too open, too honest, too fast and I offended bloggers who I greatly admired. Their open and honest feedback to me was respectful and to the point - and revealed a blind spot to myself about being too impulsive and forthright in my commenting and that it was not appropriate and indeed had been hurtful. So where I was blind to my bluntness (and my grammar! ), I now am less blind and have been made aware of those behaviours, apologized, mended fences and have hopefully learned to comment more carefully. This has turned into an overly long post. 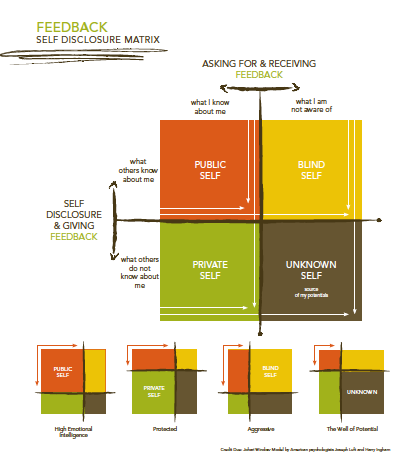 But I hope the self-disclosure/feedback matrix might prove helpful to you in your blogging life and in your private relationships. Understanding what we are doing and how we might be more skillful at it can never hurt. What an interesting post. Although I reveal stuff about myself on my blog - and have been told that those are my most interesting posts - i have trouble with the idea of posting my life on my blog. I have written many many personal posts that I later trashed because i don't know how to spin the personal stuff in a funny and smartass way. Go figure. I always knew that you were VeY intelligent, well spoken, with strong opinions - and I admire all of that about you. And besides that you are such a talented artist and gifted educator. I love the content and the education I read from you! It always comes across to me that you seem very true to your purpose of your blog and the writing and photos are thought provoking and I come away enlightened! Another insightful and useful post Bonnie and I truly appreciate your knowledge and wisdom. This is so interesting and well thought out! I blog just because it is fun and I am entirely silly most of the time. If read , fine , if not , that's fine too. It is just a blog- I roam around bloguniverse, learn stuff, laugh, recieve gems of wisdom and move on. I think that if Someone is offended by what I may post that is their problem, sort of weeds the garden of blogishness ..."honesty" is my new year word, as though it hasn't always been...There are so many blogs out there- I am amazed that anyone bothers with mine at all- it is not a popularity contest, afterall, and I have made some really good friends of like craziness whom I adore! It is amazing! AND it is just a blog, pull the plug and there it goes. My blog is purely selfish fun.In fact I haven't given it this much thought since your post here...interesting and thank you! Well done presentation Bonnie. Critical comments can come from mean spirit. I see no point in that. And critique - a time honored art tradition - well that would be a special circumstance I would think, perhaps by invitation only. I saw one artist ask for feedback. The very directive comment that followed was all about what colors and placement the commentator would use. That isn't a critique in my mind, that's steam rolling over the top of the inquiring artist. Critique is facilitation of growth. My 2 cents. I have read about this model before Bonnie and find it most interesting. Like all these models it only tells us what we may already know, but it puts it into a framework which makes it more understandable. Like in life outside blogland, we are all different. I like people to "argue" with me when I post something controversial - and I must say that they do that. I also like people to criticise my poetry - that is harder as most people don't like to do so. But I suppose that all mirrors real life. Interesting post - thanks for it. I'm pretty much an open book in what I will write about, my thoughts and feelings. I try not to leave critical comments for various reasons. If I feel critical then I just don't comment. There is so much meanness out in the world, I try not to add to it. Also, I don't really know enough about the person writing to understand where they are coming from. A lot of people think I'm crazy for blogging under my real name and revealing as much personal stuff as I do - especially since I'm a high school teacher, and it's very likely that some of my students read my blog. But honesty and openness are at the very core of my personality, so there is nothing on my blog that I wouldn't tell people in real life. It's okay with me if my students read about my personal life. It's okay with me if they read about my problems and shortcomings and insecurities. It's who I am, and I think it's okay for them to be able to see their teacher as a real person. Same goes for my friends and family, who also read my blog. They know who I am in real life, and they see the same person on my blog. I don't hide much of myself from anyone, and I don't change who I am depending on who I'm with. What you see is what you get. That said, there are times when I wish I could write about certain things on my blog, but I can't. As a teacher, there are some topics I have to stay away from. And when I write about students or things that happen in school, I have to be very careful about what I say. I'm dealing a very "unbloggable" situation at school right now, and I really wish I could write about it. You always teach us something, Bonnie, and you did so again with this post. I am deeply appreciative of your insight. I agree that we struggle with what to tell, what to keep back, and many blogs strive to do what you do with yours. I'm imparting information, of a learning quality, to my children, as well. I do not talk much about them in a public forum, forever aware of how open/vulnerable we are to the public with our blogs. But sometimes we want to use a learning tool, and writing about it in another way brings forth the desired consequences in our personal life. You hit the nail right on the head. Thank you for sharing why you do, and do not, talk about certain things. this is fascinating stuff...i too dropped my name right from the beginning but then i have dropped more than that in my posts. as far as i know only one of my therapy clients knows about my blog...oh well....too late now. will be back in a bit to read through some of this again. been offline most of the day and playing catch up...really nice though. All I can say is 'wow'. Well said, and very interesting. Yes, there are times I feel "exposed" because everyone knows my name! I keep much of my private life private, but at the same time I am open about many things, I suppose....I am careful though...very interesting post! this is a stimulating discussion because if is an issue we all face. I imagine our blogs reflect our interpersonal style of communication, tempered by our various reasons for privacy and security. We have to consider that in blogging we have no control over the audience wheras in life we can be selective and remove ourselves from company that we feel uncomfortable in. That I think is a very important consideration when we are considerind disclosure levels. Also I am by nature a reseved person who likes to keep to myself. Even with those close to me I do not share the entire contents of my inner world. There are parts of me that are mine alone. Now this does not mean that I do not have intimate relationships . I don't believe that the degree of disclosure is reflective of the level of intimacy in a relationship though it may be a general indication. Luft and Ingham originally used the word 'intimacy' to represent openness in their model, but when they brought the model to Japan they found word intimacy did not work there, and they switched to 'openness'. All that to say, disclosure is one of the main ways that we develop more OPEN relationships. Please don't reject the model because of my use of the word intimate. I mean it in the most non-sexual way -as close, relaxed connectedness - no more. No one discloses everything about their inner life and certainly blogging would never be the place to even attempt that. Disclosure and feedback must mesh with the circumstance. With this post I was most interested in using the johari window to demonstrate the power of APPROPRIATE self-disclosure and APPROPRIATE feedback. Both must fit with the context, topic and situation. Divulging inappropriately (too much, too soon, too fast) is off-putting. Inopportune feedback will usually not be helpful. We must use our good, adult faculties of judgment to determine how much and when, or even if we disclose or give feedback. I am not trying to promote self-disclosure, I just wanted to demonstrate how it contributes to more effective, interesting, close relationships - and try to apply the johari model to relating in blogs. Some of us here are not looking for relationships when we blog - so perhaps, as you suggest, disclosure is then not relevant. Others are and can then use the theory as they see fit. I have observed in my travels in the blogosphere, however, that those who disclose the most often garner the largest following. People are looking for content, beauty, inspiration, creativity, practical information, etc. ..... and connection ..... Those who disclose more relevant information about themselves develop more connections, it seems to me. That's what made me even think of this feedback/self-disclosure matrix. From reading some of your posts I thought you were a therapist, even though I did not know it. I felt it by your ways of talking about psychological matters and then asking your readers what they thought or what would they do. Your post is very interesting and educational. As you say many readers like blogs which are more personal. I’d like to say that this is true maybe because most of them are Anglo Saxon? Or of the North American culture? which is quite open. I noticed how many self tests there are here as well as “support groups”. I had never heard of anyone having a therapist until I came to the USA. I was raised in a culture that is not inclined to be too open. I worked for example with a French woman for years (20 years?) we were the only two French persons in the corporation, but while speaking French we always used the “vous” not the “tu”. While I was growing up, every time some man would visit my home, my father would tell me to go to my room – and that until I was at least 18 (he had a Middle Eastern upbringing.) So I believe culture has a lot to do with being open or not. Granted yours is not a blog for Middle Eastern bloggers, but in my case I know my family is reading my blog (anonymously as they never write comments but I know) people from my work read it too. I find myself saying much more in comments written uniquely on others’ blogs than I would dream of saying in my own posts. But I enjoy reading your posts and all the comments you receive. I thought about your post just now – I was looking at a blog I found at random called Liquid Illuzion (http://liquidilluzion.blogspot.com/) and realized that the owner of the blog just killed herself after writing her last post on Christmas eve. I saw many of her followers feeling guilty for not having understood what she intended to do. It is so sad. I wonder if she had been more open if they could have helped. I wonder how many persons write a blog to seek help with a mental problem? I'm familiar with the Johari window and the term intimacy in that context. You have raised some further interesting points that I would like to chat over with you when I next get to a computer. For no reason clear to me except that there are diagrams involved, the Johari window reminds me of Peter Urs Benders personality types. http://www.peterursbender.com/quiz/swtable.html I'm sure the concepts are intertwined. On my blog, I'll reveal almost anything because June isn't my real name and I'll never say exactly where I am. Few people in my real life know that I have a blog simply because I reveal so much personal information other than my identity. I perfectly understand your wish to remain private if your clients could be reading. As mad as I was, at one point, to know more about my therapist (at the time I worked in a place where I could stalk him and did find out where he lived, but nothing else) the fact that he is My Trusted Friend who remains a blank slate is what makes him so valuable to me in therapy. I'm not sure how much intimacy is available through blogging anyway, really. I like the distance, the filter. As for feedback, only once or twice have I received a snide reply (predictably, to me, from angry Bible-quoting people). Had they been constructive I might have appreciated them. The tone was simply and clearly negative, so I got mad and then decided the best path was to ignore them, and leave the comment standing with my lack of response speaking for itself. I don't write so much to receive feedback as to explore my own head, although I delight in hearing from people who are like-minded or share their aha moments. Seems to me that as a blogger whose blog is not "by invitation only" I have little right to be offended by responses. Bonnie this is a wonderful post and so true on so many levels. I think I am an open book in many ways, and yet there are pieces. Bonnie, I found this very, very interesting. Quite illuminating, and remarkably timely! From the time I first discovered your blog and that you are (among many other things) a therapist, I wondered how you managed to juggle the fact of your public blog identity and your practice. I always had a sense of your discretion, and found this to be absolutely normal given your profession. But when you did reveal personal things about yourself - the JW part of your life, for instance, and your daughter’s illness - I got a lot of pleasure out of discovering another facet of you. I have always tended to avoid people who reveal too much too soon, wondering at their motivation and preferring to take time to get to know someone. There have been some notable exceptions to this in my life, of course. Your situation is most interesting and I have felt that you manage to keep your boundaries intact while not remaining aloof, doing this with admirable delicacy. The Johari window makes the privacy issue really clear to me. I love this kind of model, as it explains so well what might otherwise be confusing. I have wondered how much to reveal in my blog, and just yesterday began to write an essay that I have thought long and hard about posting due to its personal content. Thanks to your very clear explanation, I now understand why I'm not 'consistent' in my comfort level about revealing myself, whether in a personal relationship or in the blogging world. But it’s so obvious, now that you’ve pointed it out! I confess that I am quite fascinated by psychology and lap up anything that helps me to understand myself and others, one of the reasons I enjoy your blog so much. I am richer for having met and learned from you. One last little point about constructive criticism. I do not always react well initially to it, but ultimately am glad to have it. In my 40s I went back to music and studied with a gifted pianist/teacher, a woman of my own age who had a wonderful, supportive teaching style. I learned a lot from her, but I wanted real criticism – the meaty kind! – that would tell me straight out what I wasn’t doing well, or correctly. But she was always very concerned with preserving her students’ egos, and in the end, my teaching style was very much like hers! Thank you each and every one!! I appreciate your sharing (disclosing) your reactions to the post. The depth and breadth of the comments is astounding. I would love to interact with each and every one, but due to time constraints I cannot. Suffice it to say I appreciate that you take the time to share your experiences and perspective here. Rich stuff from intriguing people!! Thank you for this post. I can imagine how much time and deep thought you put into this. My husband read your post (since I had left it up on the computor), he was very impressed. Amazing person you are! Thank you again. So very thought provoking. We started chatting about all of this. I do love a stimulating intellectual discussion. We all have our life ways and when we approach each other with respect than the sharing is easy. I tend to tread lightly. I open the doors and windows to my spirit with a smile. I use my main blog to encourage my readers to see the beauty in their own backyard and in themselves. I currently am blogging about a healing journey my sister and I are taking. On my Walking blog I am sharing this journey so family and friends can come and see how my sister is doing. I also hope others will find ways to connect to their inner healer. I believe we do make a difference in each other's life if allowed. I allow. I think each blogger has a reason why they are blogging. I also think the why can change. I always like feedback. If someone is mean spirited it is their problem not mine. I have deleated comments that were inappropriate. I also have met like minded people and I have developed some wonderful friendships. I have been blogging for three years. I feel as if my blog is part of my life. I feel as if those that come visiting are part of life. My kids and my family come to my blog to see what is happening in my gardens, to see the birds, bugs and blooms. My blog is discussed. My husband and I talk about my posts and my photographs. We talk about comments. We do hikes together and plan posts. We both take photographs. I feel as if my blog is like my living room. I invite anyone in and offer a cup of tea. Thank you for this post, it is a gift. Bonnie, thanks for visiting my blog. I value the quaternity structures like the Johari window. They do organize the material. However, I notice the "flatness" of the model too. I try to add a spiritual dimension to the Johari model and it just seems irrelevant. In other words, you can add or take away the spirit and still have the same model. I am not sure that is how life is, at least not my life. When I stay in the social realm, disclosure/non-disclosure is a strategy. If I enter the realm of spirit, openness is a goal. The material is organized differently in a fundamental way. This is of course a longstanding point of tension in living on the planet. If I give up the defense of staying hidden, then what replaces that? I call it "spiritual judo", and believe that people can show each other how to be more open safely. It is obvious that some of us are more open and "get away" with it. It is perhaps required at some point if you want to increase the "depth and weight" of your life. It is simply true that as life gets more profound the baggage of one's defenses becomes too heavy to carry. Christopher: Thanks for visiting back and leaving a comment. I agree with and applaud every word you say. Models like the one in this post do ignore the spiritual side of openness. They are often designed to use in training sessions in the corporate world and are made to be accepted easily in that milieu. Come to think of it, it would be hard to really capture the essence of being and openness and non-defensiveness in any such model. Sometimes you have to start where people are and many are not ready to connect openness with the spiritual. One way of working is to proceed in levels beginning with where one is. If people can simply learn that by sharing they can enhance relationships, that by receiving and considering feedback they can grow, that there are ways to offer feedback with compassion....I believe those skills can lay the foundation for the next step in the human quest. Would that we could do it all at once or simply declare, "we shall now all be open to self, other and spirit" and it would be so. I have learned to proceed slowly, gently, and openly offering skills that can hopefully begin to pry open defended hearts. I hope some of the previous commenters come back and discover your delightful contribution to the discussion. Come back again soon! This was really an interesting read. I see the dilemma you are in on using your real name and now have to "hold back" on some of the things you write. I am one of those bloggers that tells it all, I'm afraid. But it does seem that I get the most comments on those posts!